This sprinkler features interchangeable nozzles, and "leak free" seals to avoid puddling at the sprinkler. It works well at low pressures and is a great watering source for residential and gardens. Also works great for horse arena dust suppression because of its leak free wiper seal!! The 1000R Heavy Duty Sprinkler Cart with wheels is constructed of 1” heavy gauge steel pipe, a solid 1.5" steel axle for weight, and a durable "baked on" powder coat finish. The 1000R heavy duty wheeled sprinkler cart comes with Falcon Gear Drive Rotor Sprinkler Technology!! The 1000R comes standard with a full circle only sprinkler spray pattern but may be ordered in a part circle version upon request (part circle version operates between 40 and 360 degrees). With the Falcon rotor, you can have it all -- uncompromising performance, superior distribution, reliability, and durability. Rain Curtain™ nozzles maximize performance and coverage. A multi-function wiper seal and tapered riser keep the stem clear of debris, providing long-term protection. Plus, heavy-duty construction makes this rotor one of the toughest in the field. Spray distances up to 120 feet in diameter! This sprinkler will maximize your potential and is the largest you can operate from a standard faucet and 3/4" garden hose. May also be adapted to a 1" hose. Portable wheeled sprinkler carts are an excellent and affordable option for irrigating a variety of areas such as gardens, large yards or acreages, playgrounds, natural and artificial sports fields, horse arenas or round pens for dust control, mining projects, and much more. Our carts are fabricated with care and precision in our facility with heavy steel tubing and a solid axle design to prevent tipping while the sprinkler is in operation or when pulling the supply hose to reposition the sprinkler cart. These portable wheeled sprinkler carts are a great alternative to traveling irrigation sprinklers when a lower cost option is needed, the area to be irrigated is too small, or the terrain is too rough for a traveling sprinkler. This sprinkler can only be ordered "full circle only" or "part circle only". Part circle version can be adjusted anywhere between 40 and 360 degrees. Please select "full circle" or "part circle" in the drop-down box. Why Do Little Leagues Need Big Sprinklers? Youth sports organizations vary widely across the country on how they‘re run, how their structure is set up, and who is responsible for handling issues that arise. However, you’ll find one commonality among all leagues – no matter which sport or geographical region, they rely on parents volunteering their time to keep everything running smoothly. There is a multitude of volunteer jobs to which parents can lend a hand. Field maintenance is one essential area where volunteers can spend their time. It takes dedicated volunteers and the right irrigation system to keep the grounds gameday-ready. Does your team or organization have the irrigation equipment it needs? Water is one of the most crucial factors when attempting to keep your little league fields healthy and safe. If your field or fields don’t receive enough water, the soil cracks, holes develop, turf dies, and additional maintenance is required before children can safely play. Adequate amounts of water help the turf establish roots. Watering the grass one or two times a week and letting the water saturate deeply into the soil helps the roots grow to a depth of four to six inches. A healthy root system allows a field to stand up to the wear and tear of frequent games. Disease and insects are less dangerous to the field with healthy roots in place. Heat, sunlight, wind, humidity, and other climate factors affect how much water is lost from the soil each day. Using a soil probe to monitor the moisture present in the soil helps you plan your irrigation needs without overwatering. Overwatering invites disease and weeds into your ball field. Since parents are often the ones volunteering to handle field maintenance for their community fields, it’s important that irrigation is done both easily and efficiently. Keeping the cost of equipment minimal is important too since most leagues are run on fundraisers and donations. Able to cover a large area – The sprinklers are able to turn in a full or part circle and cover up to 175 feet in diameter depending on the model chosen. Easy to move – The carts are on wheels and are easily moved from one location to another. Durably made – Every sprinkler cart has a baked-on powder coating finish to help it stand up to wear and tear. Long-lasting – Since all the parts are made with care and high-quality materials, they won’t break as often as a cheap, big box store brand would. This saves both time and money by keeping you from having to continually purchase new sprinklers. More cost-effective than a built-in system – You don’t have to tear up the field and re-plant it or install expensive equipment. Less labor-intensive – You don’t need a large staff to lay lateral lines when using one of these sprinklers. Which Sprinkler Do I Need? There is a wheeled sprinkler cart that will help solve all your irrigation woes. Deciding which model is right for you depends on what kind of connection there is to your water source. Before you can make any decisions or pick your favorite, find where your water source is and see what kind of connection it has. Some fields are supplied by a standard residential spigot and water hose connector. Others are more advanced with larger supply lines and various connection sizes that can supply larger volumes of water. Larger supply lines will often use “Quick Valves” as a connection point. If you have a standard residential connection, the 1000F Sprinkler Cart is for you. 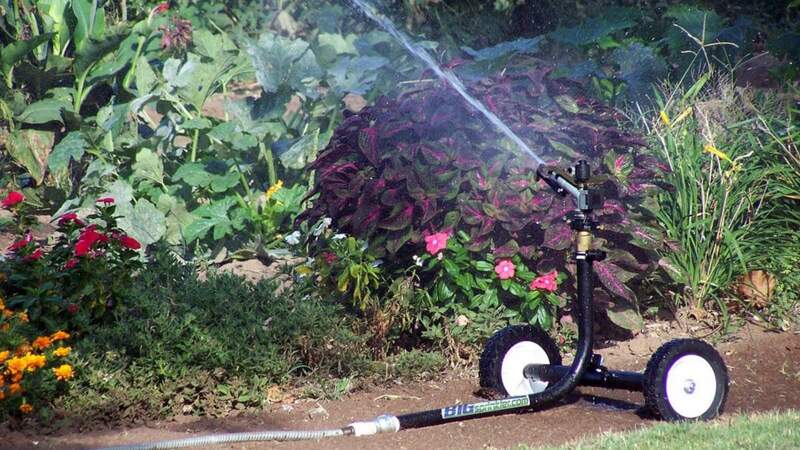 It is the largest sprinkler cart that hooks to a standard garden hose. It comes with a variety of nozzles to choose from for you to get the proper spray from your sprinkler head to your turf. 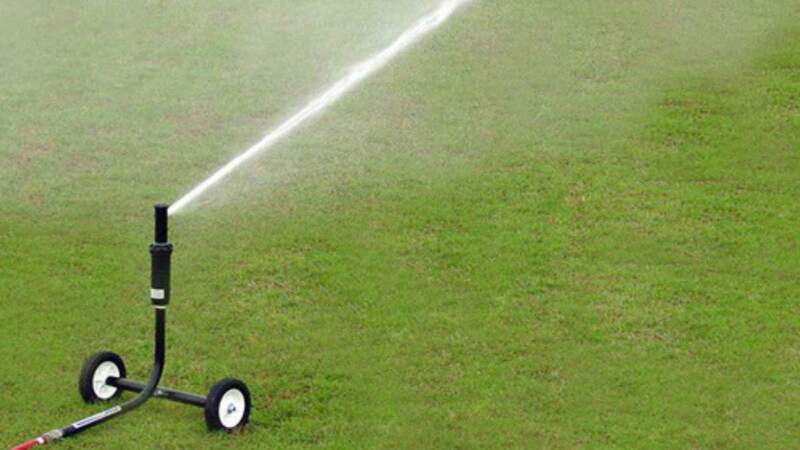 You will put more water on the fields in less time with this sprinkler than with any other option that connects to a garden hose. If you find that your field is equipped with a quick coupling valve, you will be able to choose from the 1250K Wheeled Sprinkler Cart or the 1500H Wheeled Sprinkler Cart, depending on how much flow and water pressure you are able to pump through your pipes. 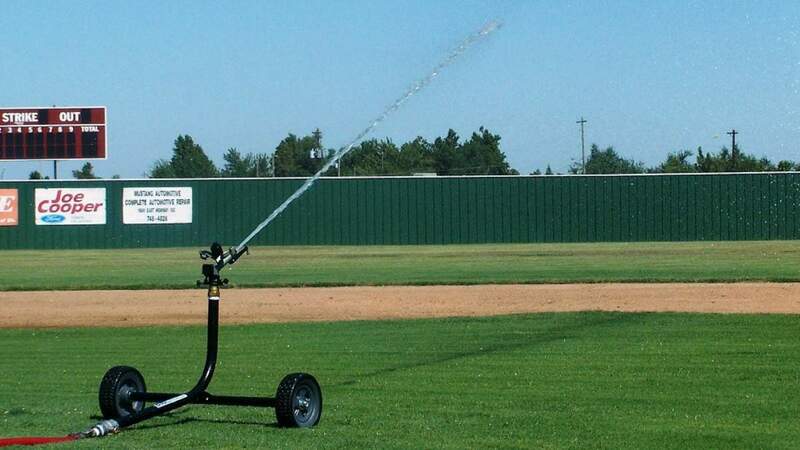 These options will help you move more water onto the field in less time than the 1000F cart can if you have the water capabilities to support them. What Irrigation Needs Do You Have? Big Sprinkler is a leader in quality irrigation solutions. Whether you’re looking to supply water to your little league sports fields or to your ample-sized garden, we’ve got solutions to fit your needs. If you still have questions about what will be right for you, check out our FAQ page. There you’ll find answers to the most frequent questions we receive. If your question isn’t there, don’t hesitate to contact us. We are here to be the experts for you. It’s true that in most parts of America we no longer need horses to manage day-to-day activities. Most people no longer use them as transportation or for farm equipment. However, necessary or not, you’ll still find a deep and abiding love for them wherever you go. Trail riding, polo, rodeo events, livestock shows, dressage, and horse racing are only a few of the popular activities in which horses become partners with their riders. Keeping the equine half of the partnership healthy is as important to successful activities as the health of the human partner. In fact, at times it’s more difficult since the horse can’t talk and tell a doctor when they begin to feel under the weather. One simple way to keep horses feeling well is to keep their living and exercise areas free from unnecessary dust. While the dust itself may not be harmful, letting it build up results in accumulation in the horse’s nasal passages, sinus cavities, and lungs. This can create some problems and intensify others. We talked about dust accumulation with veterinarian Dr. Brett Boatsman D.V.M. who works at Neel Veterinary Hospital in Oklahoma City. He reminded us of an interesting fact we hadn’t thought of prior to our conversation. He went on to discuss two common ailments related to dust that equine patients face. The first is when the nasolacrimal duct becomes clogged with dust and must be flushed. If you are like us here at Big Sprinkler, you’re probably not be familiar with the official names for horse body parts. We do know the main function of the duct is to drain tears away from the eyes allowing them to clear the eyes of foreign material and drain it to the nostrils. As humans who suffer from allergies and common cold symptoms, we can understand this kind of ailment. However, as noted earlier, horses can’t use the option to breathe through their mouths – they must breathe through their noses. This causes the horses additional suffering. To correct it, a veterinarian must step in. Another common health issue intensified by dust is called heaves. Heaves is also known as recurrent airway obstruction (RAO) or chronic obstructive pulmonary disease (COPD). It is “a chronic, non-infectious airway condition … that occurs in horses more than six years of age and is the result of an allergic reaction to inhaled particles” as defined by The Equine Hospital at Colorado State University. While the dust does not cause heaves, it causes , symptoms that cause the horse to be unable to exercise at a normal level, much like asthma in humans. There is no cure for heaves, but the No. 1 treatment for this condition is to remove as much dust, including the allergens, from the horse’s living environment. 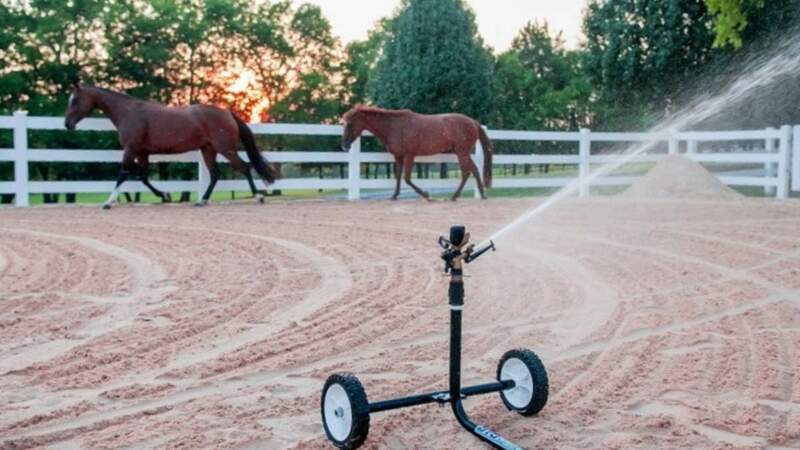 One popular and simple way to keep dust under control in an equine arena is by using water. You simply coat the dust particles, causing them to stick together and become heavier than the air so they don’t blow around. Changing the footing, or the material under the horses’ feet in an arena, can be incredibly expensive. Using chemicals can be costly, a danger to the environment, and cause additional health problems for both humans and horses. However, water is relatively inexpensive, environmentally friendly, and generally readily available. You can learn additional information on our blog about how and why water is used for dust suppression. Getting the right amount of water onto the footing of your equine space can be tricky. For both indoor and outdoor arenas, you want to make sure you get the ground wet enough to suppress the dust, deep enough so it doesn’t dry out too quickly, but not so much that you have muddy areas or puddles. This is where using a Big Sprinkler product can help. If you are interested in setting up a sprinkler to handle your dust suppression duties and then walking away, one of our traveling sprinklers might be the perfect product for you. The Reel Green RG20 and the Reel Green RG25 can both be set up to use the pressure from the hose to retract the reel and then turn themselves off when they’re finished watering. Other great options we offer are wheeled sprinkler carts. Each of the carts is made in the United States and the sprinkler heads are made of top quality materials. The wheeled carts make it easy to move them from place to place and the quality of the sprinklers ensures you won’t be worrying about leaks for years to come. Each of the models starting with the 1000F, moving up with the 1250K, and even the 1500H are able to handle a larger amount of water and will, therefore, output a larger diameter spray. Check out each of the product pages to learn more about the specific benefits for each model. If you own, board, train, or care for a horse, we know their health is important to you. We’re here to help you find the best solution for you and your equine partner’s needs. Don’t hesitate to reach out to us for more information about using Big Sprinklers for dust suppression or any other irrigation issue you might be facing. We’re looking forward to finding a solution. Did You Miss the Spring Kick-Off Sale? We were so excited that spring started peeking through the winter frosts around the country, we celebrated. Before March 31, if you purchased either a 1000F or 1000R Wheeled Sprinkler Cart, you received free ground shipping with UPS or FedEx anywhere in the continental United States. The Spring Kick-Off Sale is now finished, but we're still excited about our products and we'd love to talk about them with you. Learn more about the 1000F by pressing here. Learn more about the 1000R by pressing here. Not sure if this is the right sprinkler cart for you? Read more about why the 1000 Series is one of our most popular irrigation solutions. 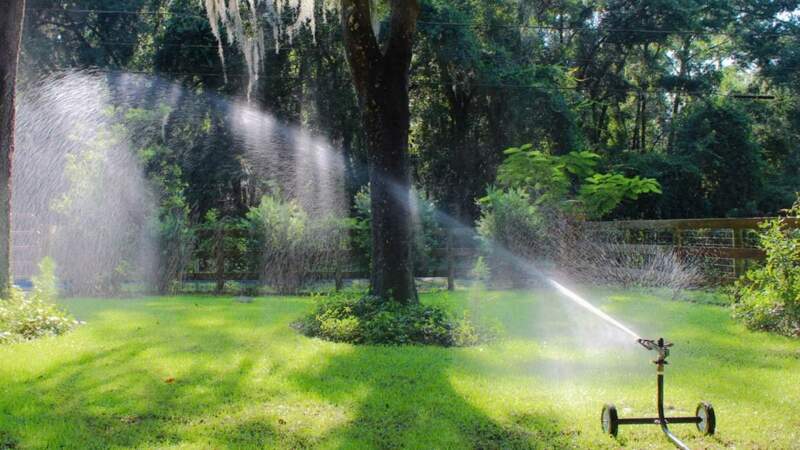 Providing top-quality products to solve your watering problems is our job. Whether it’s your lawn, garden, or farm that needs water or dust suppression for your livestock arena, we’ve got your back. We go to work each day to answer your questions and find the right solutions for your needs. If you have questions, don’t hesitate to contact us.